Lighthouse Dynamic Series Direct View LED Meets the Need! | KMB Communications, Inc. The Dynamic Series Meets the Need! The display industry is dominated by flat panel displays from home televisions, to digital signage hanging on walls or suspended from a ceiling, all the way up to giant outdoor LED signs. LCD flat panel displays still dominate the conversation for most small to medium display applications. 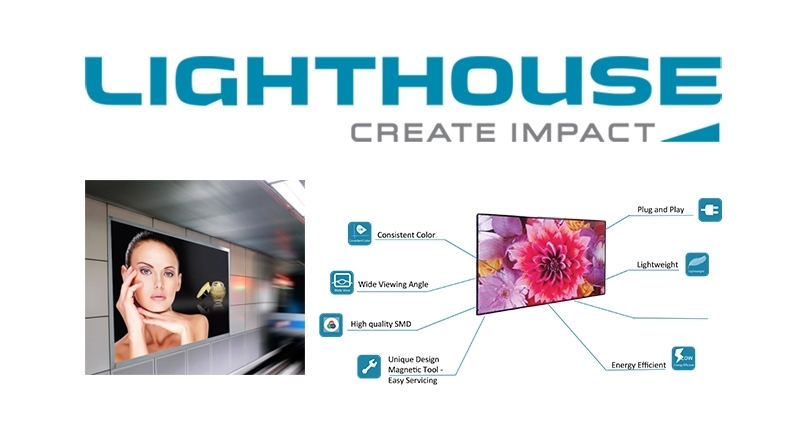 While LCDs can address big images with a matrix of panels in a videowall, it is the emergence of indoor fine pitch direct view LED that provides insight into the future of truly seamless large screen displays. There are two remaining obstacles to wider adoption of fine pitch direct view LED. One is the complexity of configuring individual led panels or tiles into a bigger display, and the second is the issue of pricing. Both obstacles are addressed with the introduction of the Lighthouse Technologies innovative Dynamic series LED displays. Playing to one of the strong suits of fine pitch direct view LED, the Dynamic series 2.5MM is seamless and comes in 89” and 118” models. They come complete as a preconfigured and framed group of LED modules on a backplane. The modules are cable-free and can be serviced from the front via a magnetic tool. A person simply orders (and receives) Dynamic just as they would a traditional flat panel display with no configuration or assembly of small modules to consider. In short, no learning curve required. Both models, 89” and 118” are plug and play in either a portrait or landscape mode. They connect to standard video sources via HDMI, and have a built-in media player with Wi-Fi, LAN, and USB connections. Since one major application for the Dynamic series will be digital signage (and retail in particular), each display comes with an included content management system (CMS), with management and scheduling tools for a group of pre-designed templates. Featuring an energy efficiency improvement of 20% over similar sized displays, the Dynamic makes it easy to specify fine pitch direct view LED displays. The second obstacle to direct view LED overall has been price. With increased volume and new manufacturing methods, prices are beginning to reflect the benefits. The new Dynamic series at 2.5MM is a prime example of this trend, and hits the sweet spot of not only the market but the prices as well. The Dynamic is priced competitively with comparably sized flat panel configurations. The Dynamic proves the point that necessity IS the mother of invention!